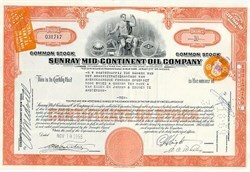 Beautifully engraved Stock Certificate from the Sunray Mid Continent Oil Company issued in 1955 for shares of Common Stock. This item has an ornate orange border around it with an allegorical figure holding up chemistry beakers in from an oil field. The certificate has the printed signatures of the company's officers and is over 50 years old. The Sunray Mid Continent Oil Company was the successor to the Sunray Oil Company. The company became the the Sun Oil Company, aka Sunoco.